Need a tracking harness for your dog? 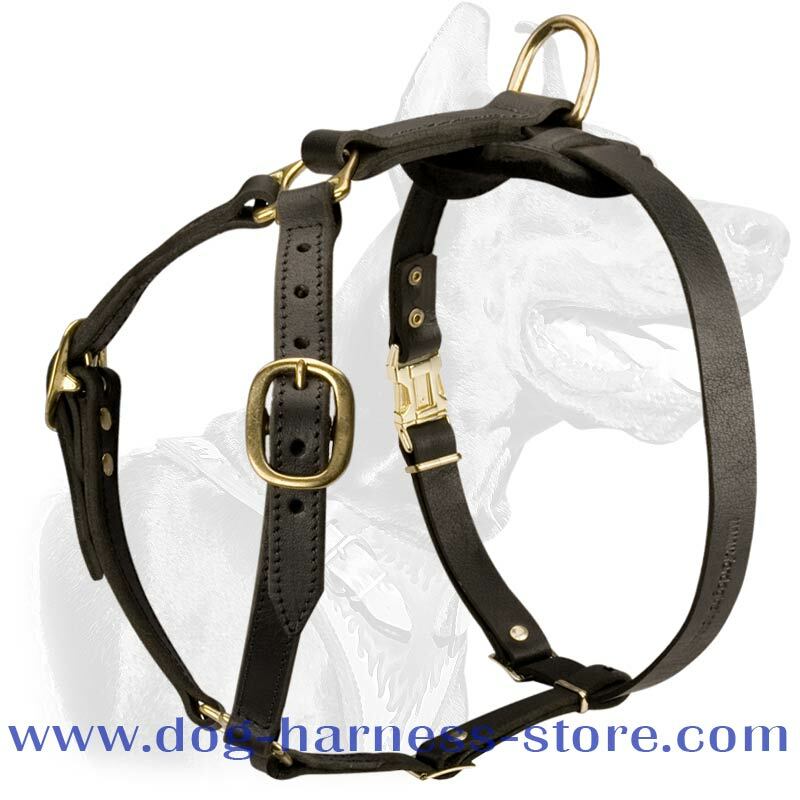 - Don’t pass over to the next page without considering this Light Weight Strap-Type Leather Harness, which covers minimal part of a dog’s body providing the highest level of control over him. No pressure on neck which may cause choking. 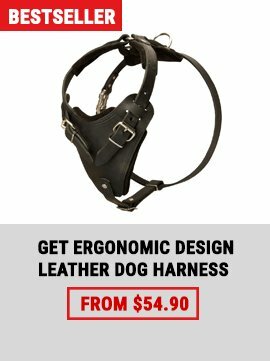 Extremely durable equipment - Yes, this harness is made of very strong genuine leather straps, that are wide enough not to cut into dog’s skin. The straps are stitched with the use of wax coated thread for additional durability and resistance to changing weather conditions. Neck straps that receive the pressure are made of two ply leather. Comfortable harness for a long-time work. - Yes, the design of the harness stipulates light weight, comfortable for prolonged field work or just walking or jogging with active dog owners. Well fitting gear. 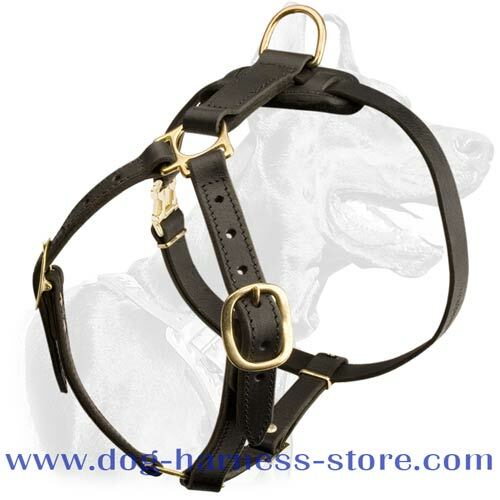 - Flexible leather straps embrace the body of a dog snug without rubbing his fur or cutting into his skin. The harness may be adjusted to your dog’s dimensions in four points (practically all straps except back one are adjustable). Handy tool for training, tracking and walking. - This harness is very comfortable for a dog, but not only. It’s comfortable for his Master as well, as he may easilly put it on or take it off using comfortable quick release buckle. 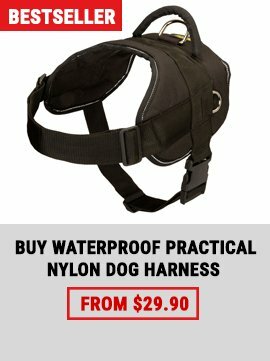 A harness helping your dog to stay fashionable in all activities. - Full grain leather is not only excessively durable - its texture won’t leave indifferent true connoisseurs of leather. Massive brass plated fittings are very durable and add luxurious golden shine to the equipment. A quality equipment that will serve you for years unless you forget to care about genuine leather using water repellent and leather conditioner. Remember that the level of your satisfaction with this harness to a large extent depends upon the size of the equipment you choose, so, please, take precise measurements of your dog following the instructions from the table. The case when luxury is estimated not by the price, but by the exhaustiveness of correspondence to the aim of creation. Create a link between you and your dog! Dominant Dog. What to do? 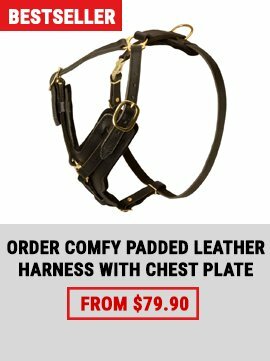 Make your dog's life even more comfortable! What toy will your dog like?